With everything that's gone on this past summer, it's been over a month since I've done any real modeling or painting. Until just the other day, I hadn't picked up a model or a paintbrush at all. Hadn't even looked at them. I know this post may be a bit off my normal stuff, but as it came to mind last night, I wanted to share it today with everyone today. I have to admit, it was really nice to sit down and do a little bit of painting the other night. The newly organized work area is a pleasure to work in, the pace is not as hectic and I feel like there's less stress hanging over me. I found myself wondering if the forced break from the hobby was a good thing in disguise. Coming back like this makes me appreciate the hobby all the more. With so many other things going on, I really enjoy the few minutes I get to work on things now. It really has become an escape that I enjoy since I'm able to put aside all the "real world" stuff and immerse myself in the 40k universe. Coming back to everything now, I realize that I don't actually play the game anymore. By that, I mean I don't make lists, I don't have an army and I can't remember the last time I played. I enjoy making models for other folks and building and painting those things that catch my eye or inspire me now. Here's another example, when I think about the new rulebook, I've yet to look through the rules section. I always open the book at the start of the background material and wander around in that. I have skimmed through the rules, but I was only looking at pictures to see what new art I could find. That's always been a big thing for me... the whole "not playing" thing. I've always felt that if I don't play the game, I'm not really involved in the hobby in some weird way. I don't think that's the case anymore. I'm happy to build and paint those few models that pull me into the 40k universe. I like the challenge that comes with figuring out how to model a certain aspect of a figure or how I'm going to paint something to give it the look I want. I'd be lying if I didn't admit that I'm part excited and part scared about the contest model coming up. It's going to be so cool to see what the challenge is and then working through it to come up with a model that can be used by someone. With so many of us blogging about the hobby, juggling real life and trying to do so much every day... it doesn't hurt if you take a few days off from the game and hobby to clear your mind. In my case it was a bit more forced, but I think a break every now and then puts things in perspective. It allows you to come back with a fresh perspective and focus on the things you enjoy most about the 40k universe. You should enjoy the hobby. I know I do more now than ever before. If you've got any questions about something in this post, shoot me a comment and I'll be glad to answer. Make sure to share your experiences with taking a break from the hobby every now and then in the comments below! I hear you on all counts. I have been excited 6th edition for months, but I'm still assembling my Necron force. I bought the foundations of my force over the course of a couple months but was busy with a commission job that didn't leave me any time to even assemble my own pieces. I now have quite a bit assembled, save for weapons. This part of the game always holds me up as I'm worried I'll chose a load out that isn't all that great. Recently, I have decided I'm just going to pick a load out and live with it, where in the past I would have magnitized the whole thing so I didn't have to make a decision. The time consuming nature of magnatizing is really holding me back from making progress elsewhere in the army, so I'm just going to choose and live with it. It doesn't help that 2 or 3 other miniature games have caught my eye in the meantime too, not to mention the Flames of War army that sits primed in a bin somewhere. I am itching to get back on with the hobby myself too, I moved house three months ago and the development of the house has eaten up every available minute so far. The new place has a good sized loft that I cannot wait to fit out as my new studio, once that is done and all my stuff is finally in one place I feel I can actually start to push myself creatively. Taking a break from time to time does really help recharge the hobby mojo. It's a shame the break was enforced due to the studio and your house getting some unexpected and unwanted renovations, but I'm glad to hear you're coming back to the hobby with a fresh and enthusiastic outlook! I think the fact that you're more interested in the build/paint aspect of the hobby than the game mechanics frees you up quite a bit artistically, I'm looking forward to seeing what comes out of the new and improved workshop. Keep up the great work, Ron! Andrew: I did that with my Deathwing. Just picked a weapons loadout and went with it. I based it off the background and I ended up having lots of fun with it. And don;t neglect that FoW stuff you have. Working on that stuff might provide just enough variety to inspire and recharge your 40k work. Munky: Get the new place set up right and you'll enjoy it all the more when you get back to work. Mordian7th: I know, I would have liked to have been able to step away for maybe a week or so with some posts lined up while I took my break. I think letting go of the "playing" has helped me too. I don't feel like I have to meet any artificial guidelines now with my models. Not that I'm going to go crazy with it, but it's a nice change. I can empathize with you on this one, Ron. 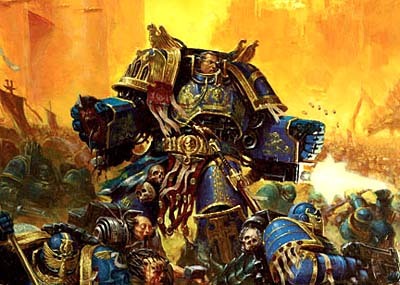 I got into Warhammer and 40k because I was enjoying painting random miniatures (mostly Reaper and Iron Kingdoms) and I said "Hey, isn't there a game to go with some of these things?" Here I am three years later and I've finally realized that I *hate* painting armies. I can't get into it! When I was doing single models (including Deathwatch figs for my RPG group), I loved it... because everyone had character and a story and a personality. When I tried painting armies, I felt like I was painting Generic Soldier #1 through Generic Soldier #3728. There wasn't any flair, especially in 40k where you need loads of troops. Definitely know that feeling Ron, haven't made an armylist myself in well over 6 months. Simply haven't had the time, motivation nor gaming partners for it. At the same time I've gotten rid of some old stuff, giving most of it away to friend and folks In know through the internet. Instead I've completely shifted to single models, simply converting and painting mini characters when I feel like it. Having a lot more fun this way and if eventually stuff does turn into a real army, that'd be a bonus. This was the hobby has become much more fun to me, that's not too say that some external motivation cannot help. Recently finished some converted thousand sons for a charity project, which was a fantastic, little project! In the end it does all come down to enjoying our time behind our hobby desks and the occasional gaming table! One of my favorite professors in college used to tell us to walk away from our paintings. Put them away and don't look at them, for days, even weeks. He had one project where we started the painting at the beginning of the semester, then he took it away from us for a month or so, gave it back to us to finish. He called it 'cleaning your eyes' in his thick Lithuanian accent. Ended up with some of the best pieces I did in college that way. It never hurts to take a fresh look at almost anything in life. Of course, the downside (at least for me) is that I do this with my 40k projects and my pace for finishing 1 army is positively glacial... of course I have 6 I'm working on and frankly, with GW constantly putting out cool new mini, I may never finish. Like you I hobby, though I do get in a game occasionally- once a month or so. It has been a month since I have picked up a brush and went to work on my orks. Painting boy after boy grinded me down to the point where I loathed painting. Slowly, the desire to paint has been building back up, but it is now a matter of finding time to do so. Much the same over the pond with me Ron, I take a break from it every now and then, and when i come back i am always refreshed. Playing the game was almost a non event in 5th edition, but i have picked up the dice again with 6th. However the hobby for me is painting and building, i love the creation of a force that comes under the "rule of cool" and will make me want to paint it to a high standard, i did this with the space wolves, which were originally just for ebay, but now they are my playing force for throne of skulls in october. However on the bench i have a GK force and a deathwing army that is about to be spurred on by the new dark vengance set. Then i go onto individual figure painting as a slight change of pace. Its your hobby, do as you want with it and above all enjoy yourself. Oh can i log into the FTW blog as a user rather than typing my name each time, as i only have a CMON free blog? For me, I split my time between my hobbies ( 40k and everything that comes with it and American football, wich isn't as highlevel here in belgium, but I play in one of the top ranked teams ), and that gives me an annual 'downtime' from each. When it's football season, the 40k aspect of my hobbytime gets turned down alot, while in the off-season, the time goes up alot. You and me are alot alike. I have never ever played a game ever. But am on my what 20th army now. The only thing I do different is I read the rules so my minis are game legal and useful. So it is easier to sell. I do plan on playing this year getting bit by the terrain bug in a major way. It is always great to take a break,it recharges your batteries. My last break however was when I broke my painting hand and was OOC for 2 months. It's so cool to see how you guys use the hobby. And it's not just "playing" either. Rednekkboss: My art teacher used to tell us to back away and look at our work from a distance. I never had them take it away for that long of a time though. Richard Rose: I don't know. There are a number of accounts that are linked out there. I'm not sure which ones Blogger supports in that fashion. Anvil: The squirrel was very funny. I always took a half year break from 40K. Iv'e done it about once a year for the last 7 years. It helps a bunch, and each time I do it, I have new ideas, new strategies, and new opportunities to grow. Every time I come back, I like it more and more. I even left my hobby group cause it was nothing but a-holes, and it took my last break for me to realize that. Now I am having way more fun playingg only friends and familly. Thanks for you efforts Rob! Hivetyrant36: Half a year is a sizable time. I think the biggest thing is that you come back refreshed like you said. Your love of the hobby is renewed and you can get right back into it with ease.